Mumbai-headquartered, education focused, non-profit, Teach for India (TFI) is popular across India for providing exceptional quality, performance driven education to students enrolled with underserved state-run or private schools. The trained 'TFI Fellows' (teachers) are recognized for their smart, participatory approach, and innovative ways of conducting classes; fostering the child's holistic development. 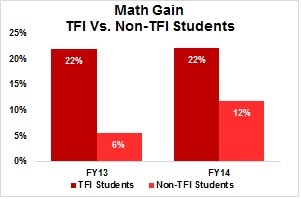 Between FY10-FY14, TFI has grown 6x in terms of the number of schools covered across 5 cities; the number of children impacted shot up by 12x with nearly 10x increase in the number of TFI Fellows. Besides this, TFI has demonstrated remarkable change in a child's academic performance; setting higher performance benchmarks relative to non-TFI supported students. TFI's well-defined model helps to source, train and nurture TFI Fellows to become a catalyst of change while they are placed as teachers in schools for two full years with an objective to eradicate education inequality in India. This method clearly differentiates TFI from other NGOs working in the education space. TFI's strong base has helped them spread its reach faster than anticipated. With the support from State Government, over 20+ MNCs, 2,000+ Individual Donors, and 150 staff, TFI is well positioned to bring about radical change in the Indian education system. While TFI has not seen any SSC (10th grade) pass-out batches as yet, it must be noted that 20,000+ TFI students have outperformed non-TFI students by almost 95% in subjects like English and Math across different grades. 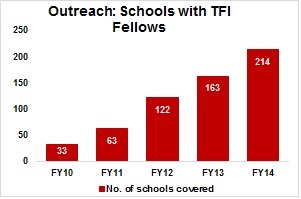 Besides this, TFI now has an alumni network of 417 graduated Fellows working in diverse fields. Interestingly, about 60% of Fellows graduating each year, choose to pursue teaching over other career options, by either remaining associated with TFI or working independently. 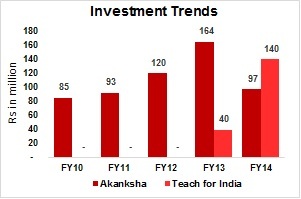 Impressive 3-Year income CAGR (102% for FY10-FY14); low fund raising costs (2% average for FY11-14) and over 85% spend on beneficiaries, coupled with visible change in children’s holistic development make TFI a compelling organization in the education space. TFI is governed by 11 highly regarded individuals from the non-profit and corporate world. All members are active and are involved in fundraising. An active and strong board is one of TFI’s biggest plus points. In FY13, TFI went virtual by availing services from Salesforce.com to centralise their reporting system on a real-time basis. TFI maintains a very high level of transparency by publishing detailed financials and annual reports. TFI recognizes the dire need for quality education in the rural and semi-urban areas but due to lack of understanding and various other issues, TFI is unable to scale their operations immediately to these areas. Note: 1. Adjusted for Transfers to Reserves. TFI is working towards addressing a major concern in the education space, viz., education inequity! It aims to bridge the gap between the quality of education offered to underprivileged children in government schools and low-income private schools. Moreover, TFI wants to replicate this model across the country by training the youth to become future leaders and helping reform the education sector in India. TFI hires graduates and professionals as TFI Fellows who undergo six weeks of training. TFI works with state government bodies to identify schools with teacher vacancies which are then filled up by placing TFI Fellows. They are then placed for a 2-year full time teaching position with well-defined accountability for their classrooms. TFI takes responsibility for these children from Grade II to Grade X. TFI's curriculum is designed to a) bridge the academic gap, b) inculcate right values, and c) provide industry exposure through field visits. TFI Board sanctions an annual budget of Rs500,000 per class and the Fellow is responsible to prepare an annual plan and deploy the funds suitably for the benefit of the class. Each Fellow is paid a stipend of Rs17,500 p.m.
TFI is among the very few education-focused organisations having executed long term MoUs (minimum 5 years) with State-run schools to educate their students. The model followed by TFI has been inspired by Teach for America and the India chapter is spearheaded by Shaheen Mistri. TFI began working towards this noble ambition in 2008 and in 2009 placed their first group of trained teachers called ‘Fellows’ in low-income government and private schools in Pune and Mumbai. They now (2015) have 910 ‘Fellows’ spread across 7 cities - Mumbai, Pune, Delhi, Hyderabad, Chennai, Ahmedabad and Bengaluru. Teaching 25,000+ underprivileged students across 214 state-run, private, NGO run schools spread over 7 cities. Raised the level of proficiency in English and Math for all students. 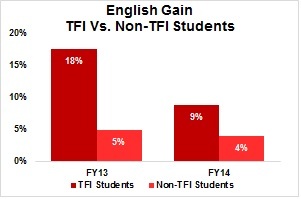 TFI students outperformed students in non-TFI schools (study conducted by Columbia University). Provided emotional guidance to several students not receiving co-operation from their families to pursue education after a certain age. Convinced the Pune Municipal body to incorporate Grades 9 & 10 in the English Medium schools across the city. HYNGO's team members have interacted with a handful of TFI students and we were impressed by the way students conduct themselves. They are smart, active, knowledgeable, confident and creative, with an excellent command over English. Nurtured 413 Fellows to become change agents in society/corporate India. 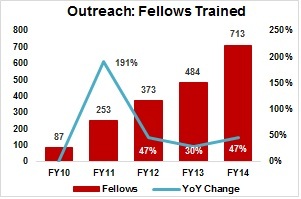 The network of TFI Fellows has reached from 87 in 2009 to as large as 910 as on March 2015. Offered jobs through placement cell. 141 employers participated in 2014 posting 296 jobs for TFI Fellows. Self-Sufficiency Ratio (SSR): TFI’s SSR improved from 23% in FY13 to 93% in FY14 v/s sector average of 61% in FY14. Healthy SSR was owing to 10x YoY increase in general donations and almost 50% increase in other income due to receipt of reimbursement from schools in FY14. Income Growth Rate (IGR): TFI recorded a whopping 4-Year IGR of 102% during FY11-FY14 owing to triple digit YoY income growth in FY12 (202%) and FY14 (136%). 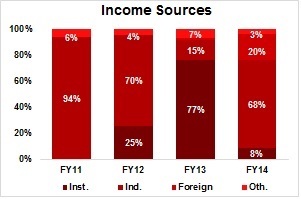 A 36x increase in foreign contribution and 10x increase in general donations fuelled the YoY IGR in FY14, v/s only 15% in FY13. Repeat v/s New Donors: About 60% of donations come from TFI’s committed donors. This includes individual as well as institutional donors. Some of TFI’s repeat donors include Credit Suisse (6 years), Bank of America (6 years), JP Morgan (4 years), Deloitte, and KPMG. 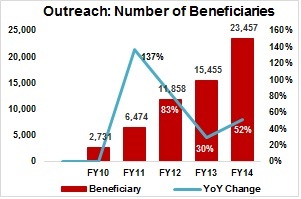 Used for Beneficiaries: TFI’s spent 88% of total donations received in FY14 on direct programme activities. Of this, 77% was spent on stipends paid to TFI Fellows and as salaries to people directly involved in programme activities. 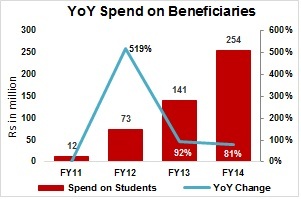 TFI's 3-Year average spend on beneficiaries was 73% v/s the sector average of 55% between FY12-FY14. 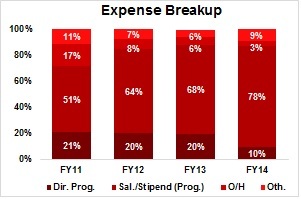 Fundraising Cost / Total Expenses: TFI has consistently spent less than 1% on fundraising expenses since FY11. Such a strong income growth with low fundraising costs can largely be attributed to the efforts of TFI’s advisory board comprising of highly influential individuals in corporate India. TFI keeps fund raising costs low by refusing to adopt fundraising routes like using call centres and telemarketing. Fellows can take the initiative to raise funds from the community for additional class activities. This is independent of any financial aid from HO. Fellow Training Cost: TFI spends roughly 2-3% of total expenses annually to train its Fellows regularly. Cluster training sessions are held once every six months. The training cost is absorbed in the Direct Programme Activities. Day’s Cash Ratio (DCR): TFI’s DCR deteriorated from 648 days in FY11 to 46 days in FY14 owing to: a) gap in the growth rates of total expenditure (203%) and cash and cash equivalents (42%) during FY11-FY14; and b) 250% YoY increase in investments in FY14. At the end of FY14, TFI had liquidity for only 46 days required to meet its operating expenses. This should not be an issue as TFI has adequate investments. Current Ratio (CR): TFI’s CR stood at comfortable level of 3.7x at the end of FY14 v/s sector average of 20x for the same period. Founding member Ms. Shaheen Mistri is also the founder of The Akanksha Foundation. Her contribution in the field of education for underprivileged children in India is recognized globally. TFI has a strong board with 11 members involved in fundraising activities and strategic decision making. No remuneration is paid to Board Members. The organisation has disclosed the highest and lowest salaries, including that payable to the CEO. TFI presents 2 narrative reports each year and quarterly fund utilization reports to all its donors. Does the Board rotate once in 3 years? Does the board meet at least 4 times a year? Not more than 2/3rds of board members related by blood/marriage? Does the NGO report regularly to the donor? Expansion in Rural India: At present, TFI operates from seven metro cities. TFI has a high standard for its Fellows - only 8% of those who apply get selected. Due to a dearth of skilled and efficient personnel, TFI is reluctant to spread its reach in rural India at the moment.